TAKE A LOOK at that cover art – a clue to the polychromatic flamboyance of this new release from the Tommy Smith Youth Jazz Orchestra. Formed fourteen years ago by renowned Scottish saxophonist Tommy Smith, the TSYJO has consistently provided an important, ongoing, step-up platform for young jazz musicians. This third album is a real joy because, rather than reflecting any insecure naivety of youth, Effervescence emphatically displays the orchestra’s unfettered go-for-it creativity, all backed up by solid musicality. In fact, all eight of these sumptuous tracks fizz without any trace of inhibition, Smith’s choice of material showcasing the players’ versatility. The breathless, strummed pace of Woody Herman’s Apple Honey sets the tone. Complete with feisty wah-wah trumpet section and rolling saxes, Liam Shortall’s brash trombone antics are met with appreciative band cheers; and Helena Kay’s whirling, spirited clarinet connects with the piece’s origins. Jerome Kern’s familiar phrases in The Way You Look Tonight (lavishly arranged by Florian Ross) swing with life-affirming positivity, summoning a delicious alto spotlight from Adam Jackson, whilst a tangible rhythmic reduction clears the way for trombonist Kevin Garrity’s sublime, held-back solo. Glitzy Blues March (Benny Golson) parades to snappy snare, with infectious piano swing at its heart; and Florian Ross’ expansive arrangement of Chick Corea’s Humpty Dumpty (more familiar in trio format) is imaginatively colorised by guitarist Joe Williamson and pianist Pete Johnstone, including an intricate feature for drummer Stephen Henderson. From within the orchestra’s ranks, trumpeter Sean Gibbs’ composition Tam O’Shanter coolly saunters to crunchy, pitch-bent rock guitar and high-blasting trumpets before its switch to an effusive, driven, spy-thriller of a middle section; and the big-band swing of Nefertiti (Miles Davis, arr. Ross) is becalmed for Michael Butcher’s lush tenor solo, supported by smooth, sustained trombone voices. The rapidity of Things To Come is audacious (you can almost sense Dizzy Gillespie applauding Sean Gibbs’ display from the wings), whilst the orchestra’s sensitivity to crescendi and diminuendi is especially notable, underpinning a fluvial alto solo from Helena Kay – altogether an utterly convincing performance. And Christian Jacob’s tightly-swung arrangement of Chick Corea’s Bud Powell, featuring tenorist Samuel Tessier, is both sleek and snappy. Entertainingly feel-good, all the way, Tommy Smith and his players are to be congratulated on this exuberant release. Effervescence is available from the Scottish National Jazz Orchestra website or Amazon. Also available: Scottish National Jazz Orchestra’s Beauty & the Beast – an original work composed and directed by Tommy Smith, with guest saxophonist Bill Evans. ‘IT’S COMING ON Christmas’… so thoughts turn to seasonal musical fare to accompany the annual twelve-day celebration. On a purely personal note, much of my Advent and Christmas listening is based on choral music and the 20th Century British classical tradition. But this series of albums, Christmas With My Friends, has caught my attention since its inception in 2006. 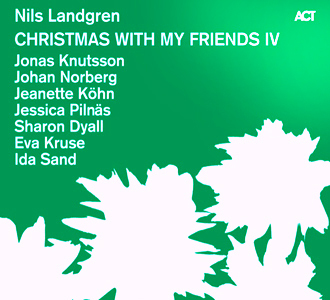 Now on its fourth volume, respected Swedish trombonist and vocalist Nils Landgren once again gathers together colleagues from the ACT Music label to join him in this now-distinctive, collaborative selection of music for Christmastide which is both secular and spiritual, bridging genres (including traditional, folk, jazz, pop, choral, classical) with particular warmth, intimacy and harmony. So, amongst the fifteen numbers: familiar English carol The First Noel, led by vocalist Ida Sand, is given an amiable jazz flavour with the soprano sax extemporisations of Jonas Knutsson; Duke Ellington’s Come Sunday makes it into the festive season with an upbeat, bluesy vocal against gently rhythmic guitar courtesy of Sharon Dyall and Johan Norberg, as Nils Landgren adds typically nimble trombone lines; and a jaunty Santa Claus Is Coming To Town jives to the winsome duet simplicity of the funkmeister’s trombone and Eva Kruse’s double bass. The original SATB precision of John Rutter’s Angels’ Carol is translated into a hearty popular ballad delivered by vocalists Jeanette Köhn and Ida Sand, complete with soft jazz sax break; and Johan Norberg’s evocatively chilly Icicles, played on kantele (similar to a dulcimer), is reminiscent of the ambiences of the Knutsson/Norberg album Skaren: Norrland III (ACT). Renditions of popular tunes include What A Wonderful World and Wham’s Last Christmas, and enduring carols such as In The Bleak Midwinter (Holst/Rossetti) are bathed in a different, contemporary light. 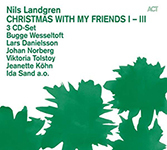 But, so often, it’s the revelatory interpretations of lesser-known treasures that magically become established in the holiday soundtrack – for example, Maria dutch ein Dornwald ging and Det grinner en stjärna for solo voice, embellished by the sensitivity of Landgren’s trombone and shimmering to watercolour kantele. Adolphe Adam’s O helga natt (O Holy Night) is enchanting in its measured delicacy, and the unassuming, closing interpretation of O du fröhliche glistens in vocal/instrumental new-age innocence. On reflection, this may not be the strongest in the series, occasionally veering a touch close to ‘schmalz’ (though perhaps a vital ingredient for some). Nevertheless, it still makes a very welcome addition to Landgren’s delightful, continuing project – and volumes I-III are now wrapped up neatly in a limited edition 3-CD set (see below) or available singly. As December proceeds, all four are recommended to bring cheer – ‘singing songs of joy and peace’* – in alternative, heartwarming style. 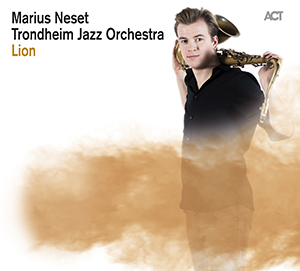 Released on 3 November 2014, further information and audio clips are available at ACT Music.